The Torrisi/Zalaznick/Carbone trio have an incomparable knack of recreating tradition with just enough bold choices to push out the fourth wall of their newest spin on Italian home-grown specialties. Carbone, their heavily shaded bistro in Greenwich village isn’t just another black-and-white-tile-floor stuffy-service-from-vest-wearing-waiters variation on a ga-jillion other Italo-American tables around Manhattan, but rather a passionate haven for delivering plate after plate of conversation-stopping “optimizations” on traditional dishes that make you want to have ALL your meals from here. The intimate wood and brick space is made even cozier by the darkest of green walls – and the rather deliberate 50’s rock ‘n roll soundtrack proves to be the perfect ice-breaker or conversation starter. 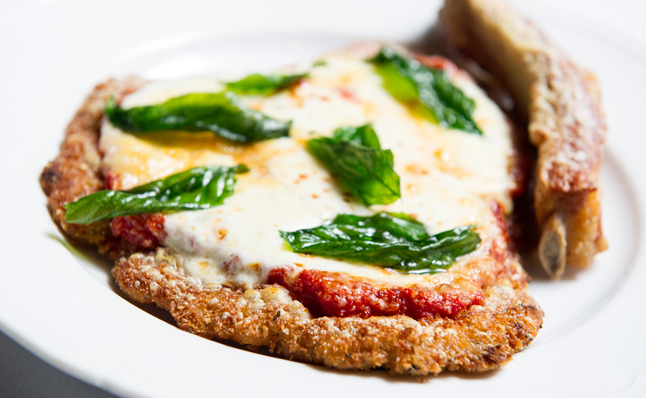 But now to the food: If the Lobster Fra Diavolo and garlic drenched (almost french-toast) croutons in the Caesar salad doesn’t seal the deal, the pizza-styled Veal Parmesan will rewrite cooking history as you know it. Their generous wine list offers large to medium producers from the usual abundant regions of Italy, but also some strong and surprising representation from Sicily and beyond. The staff seem to understand that when you eventually manage to land a table here (the lottery can be won in less time), you deserve to be treated like family. ← Welcome to my food blog!